Big capacity and good care for clothes, protect suits from dirt, dust, damp and bacteria. 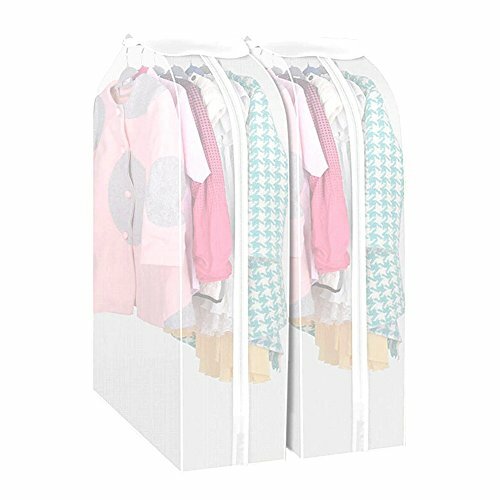 Ideal for travel & long term storage of wedding dresses, evening dresses, dresses, suits, coats, jackets, trousers and longer clothes. - Made of PEVA, BPA free and no odor.Water and mildew resistant. - Shaped shoulders and preformed hole for hanger hook. Ideal for wardrobe, storage or travel. - Perfect length to cover suits, shirts, blouses, tops etc.100% brand new. - Fully Breathable & Acid Free for safe longer term storage - Prevents yellowing - Will not run colour. EASY TO CARRY - There is no frame in the dress bag, which makes it easy to fold and take it along while traveling. If you have any questions about this product by Yangshine, contact us by completing and submitting the form below. If you are looking for a specif part number, please include it with your message.